Gajananbuwa’s first and principal Guru was his father Pandit Anant Manohar Joshi affectionately called Antubuwa. His family and many of his disciples used to address him as ‘Baba’. Antubuwa was born in the year 1881 in a small village ‘Kinhai’ near Aundh in Satara District in Maharashtra State. Antubuwa’s father Pandit Manoharbuwa was also a singer gifted with a melodious and sweet voice. Pandit Manoharbuwa’s performances were so impressive that in a concert where other musicians were also performing Manoharbuwa would be the last performer; an honour normally bestowed upon the ‘best’ musician in a gathering of several musicians. 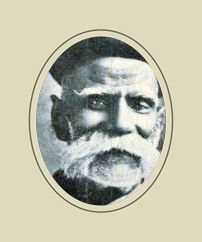 Pandit Manoharbuwa unfortunately died when Antubuwa was only seven years of age. Antubuwa’s mother after some preliminary training in Music to Antubuwa by one Mr. Ayachit approached the great Pandit Balkrishnabuwa Ichalkaranjikar who agreed to teach Antubuwa. Balkrishnabuwa himself was a highly accomplished and eminent musician of Gwalior Gharana Gayaki. Antubuwa received training from Balkrishnabuwa for about eight to nine years after which Antubuwa began his own career as a Gwalior Gharana Vocalist initially as a court singer of the princely state of Aundh. As luck would have it Antubuwa got an opportunity to travel with and accompany on Tanpura the Great Ustad Rehamat Khan Saheb whose father was Ustad Haddu Khan Saheb one of the originators of the Gwalior Gharana. Needless to say that exposure to Ustad Rehamat Khan Saheb’s Gayaki enriched Antubuwa’s Gayaki. After couple of years in the company of Ustad Rehamat Khan Saheb Antubuwa settled in Mumbai and started his own school of music. In addition to teaching, Antubuwa also wrote and published books for learners of music. However, due to the changed circumstances in his life Antubuwa left Mumbai and returned to Aundh as a court singer of the Aundh State. His services were welcomed by the well cultured and supporter of arts the prince Balasaheb Pantapradhinidhi. 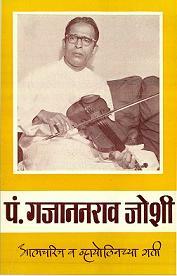 Young Gajanan was already showing signs of a sharp and intelligent learner of his father’s music. In Mumbai Antubuwa’s school was open for nearly eight hours. So young Gajanan was exposed to music for a long time on a daily basis. However Gajananbuwa’s face to face training from Antubuwa started in Aundh. The initial musical conditioning (संस्कार) of Gajananbuwa took place under his father’s tutoring. The seeds of pure Gwalior Gayaki were thus sown in the fertile mind of Gajananbuwa at a very tender age. 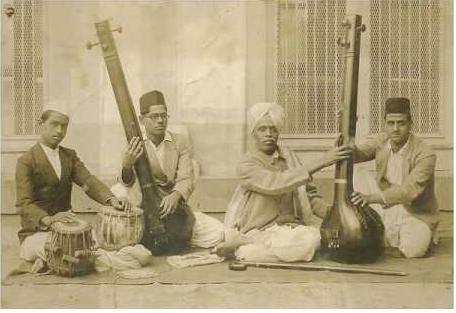 Although Gajananbuwa later mastered the Gayaki of Jaipur and Agra Gharanas his first and last love always remained the Gayaki of Gwalior Gharana. In fact his Violin playing mostly was based on Gwalior Gayaki. It is interesting and quite revealing how a good grasp by Gajananbuwa of his father’s Gayaki was observed by none other than the great Ustad Faiyaz Khan Saheb of Agra Gharana. Gajananbuwa had an opportunity to meet Ustad Faiyaz Khan Saheb in Mysore. Khansaheb asked Buwa to sing for three consecutive days. Buwa responded by singing for an hour or so on each day. After the third day’s singing session of Gajananbuwa Faiyaz Khan Saheb asked Buwa how-come Buwa picked up the Gayaki of Ustad Rehamat Khan Saheb given that Buwa would not even have seen Rehamat Khan Saheb let alone listened to Rehamat Khan Saheb’s music. This is an excellent example of how a sensitive and intelligent young boy learnt the Gayaki of his father Antubuwa whose Gayaki in turn was influenced by Rehamat Khan Saheb’s Gayaki! Giving a judgement on his son's progress in Music Antubuwa as a Guru of young Gajanan observed that “Gajanan was very intelligent and quick to pick up with ease - like a blotting paper - the various features of Gayaki! He had an inherent talent for rhythm . He also learnt ‘Jaltarang’ Harmonium,and Sitar. He thus learnt both Gwalior Gayaki and instrumental music at a young age”. Please check out the following web links to listen to Antubuwa’s performances. Gajananbuwa had accompanied his father in some of these performances. Listening to Antubuwa’s performance is like going close to the original roots of Gwalior Gayaki the Gayaki that Gajananbuwa preserved and enriched throughout his life.